At the UN Committee Against Torture. 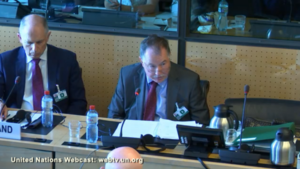 An Irish official from the Department of Justice, sitting next to Minister of State for Justice and Equality David Stanton (left), spoke to the committee about the report into the Magdalene laundries by former Senator Martin McAleese published on February 5, 2013. 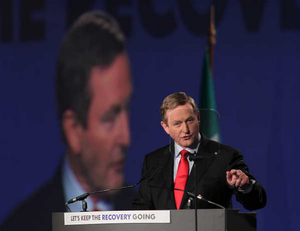 “I have to say at the start the Taoiseach’s apology and the findings of the McAleese report still stand. There’s no question of walking back from either. He also looked at the question of unlawful imprisonment. 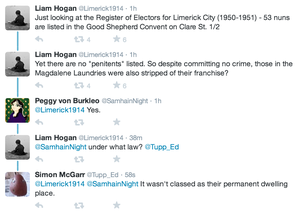 There was never any legal basis for detaining a woman in a Magdalene laundry if she was an adult. And at the time, the age of majority in Ireland was 21. So that’s, any woman who was 21 or older, there’s no legal basis for their detention in a Magdalene institution. A number of women, when interviewed by the chairman of the committee, did say that they were unsure of whether they were always free to leave and a smaller number of women who felt that they were being detained against their will but those particular cohort of women all came through the industrial schools and there was a provision in the act that governs those industrial schools that provided that a child committed to an industrial school could be subject to controls up the age of 21. So that there would be a legal basis for them being restricted, their liberty. We have no reason to believe at this stage, that there is a body of evidence out there which was not looked at by the McAleese committee. But if there is evidence of criminal abuse that’s newly available, we would be happy to receive it from any source. The McAleese committee did look for all relevant diocesan records and did inspect material from the Galway diocese. In addition, the Department of Justice itself, and separate to the committee, did receive material from the Galway dioceses, because it lists a number of individuals and that facilitated the granting of payments to those individuals because it proved that they were in that institution. There are questions of sensitive personal data regarding the archives of the McAleese committee. A person who was in a Magdalene institution is entitled to access to religious records relating to her so any individual who wants to access records relating to them may have access to them. There is no statute of limitations in Ireland for criminal offences. We are not aware of any civil action that has been taken in the Irish courts relating to a Magdalene institution and has failed because of the statute of limitations being envoked. Moving on to the actual scheme itself, Judge Quirke recommended that only two criteria be applied for the question of eligibility for payment, under the scheme. That was one, the person was admitted to the, one of the specialised institutions and the second was they worked those in those specific institutions. In that context the Government decided that persons should not benefit from two schemes with one exception. And this was an exception that was specifically recommended by Judge Quirke, it was a report and that is in relation to girls who were transferred from industrial schools to Magdalene laundries under the relevant legislation and the exception applies where the period up to the age of 18, so in period up to the age of 18, they’re eligible for possibly compensation, or payments, from either the Residential Institutions Redress scheme or the Magdalene scheme. But for the period over 18, it’s limited just to the Magdalene scheme. The question of medical assistance abroad was mentioned. The provision and statutory provision has been provided for the provision of medical assistance in Ireland. But, obviously, that can’t be applied to other countries because we don’t have the jurisdiction over their medical system so the arrangement is done on an ad-hoc basis, individual basis, depending on which country they’re in, arrangements made on that basis. 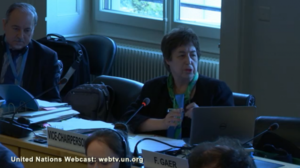 Felice D. Gaer, a member of the UN Committee Against Torture, above, recalled the words of the late Sir Nigel Rodley who addressed Irish officials in 2014. He referred to your legacy of abuse and I’m going to quote him here: he said it was ‘quite a collection’. Quite a collection and his view was, he said it is time the Irish state stopped it’s automatic response to every scandal, being to first deny, then delay, then lie, cover-up and, eventually are forced to throw some money at it and hope it will go away. “Now, this is a surprisingly sharp omment from him and I only bring it up at the end now because first I wanted to honour his memory but recalling this, I also wanted to recall that when we reviwed Ireland the first time, in 2011, Mr Shatter [former Justice Minister Alan Shatter] came in and his response to the question of what was happening with the Magdalene laundries was to say that the, this was something that happened long ago, that the girls…and it was only by, that everybody had gone there with consent. Posted in Misc and tagged Magdalene Laundries, McAleese Report, UN Committee on Torture at 4:43 pm on July 28, 2017 by Broadsheet.